This page was updated 3-15-2019 with a bulletin regarding the major flooding in Nebraska and other states in the Midwest. After reading the bulletin continue reading below it for additional useful information. March 15, 2019 - Nebraska Record Flooding Alert - Dams, Nuclear Plant, Downstream Areas Endangered. Massive flooding is being reported on Nebraska and other areas of the Midwest. A number of dams are threatened, including major dams. We are aware that at least one dike has already been breached. If one endangered dam breaks a downstream nuclear plant would likely be affected. There are reports of widespread power outages causing loss of heat and lighting in homes and commercial buildings, a major problem because of freezing cold in some affected areas. It is too soon to know if general aviation transportation provided by volunteer pilots and their groups will be needed, but given the widespread flooding and the large number of communities affected, and the closure of numerous roads, the need for General Aviation transportation of first responders, work crews, and relief supplies will likely be needed. We recommend that all the groups and their pilots monitor the situation and stand ready to be of assistance should the situation call for flight support and your pilots and groups may be able to help. Group leaders should reply and let us know if your volunteers are ready to help and if and when they are conducting operations so we can send agencies and communities in need your way. Send your information to mail@evac.org . Typically larger communities quickly regain road access, but many smaller communities often are cut off for days and even weeks, depending on a event's severity and location. As before please do consider the possibility your group can assist when the weather and circumstances permit. We are again providing the information below that we sent out before prior emergencies. Please keep it on hand. Feel free to copy and circulate it to your volunteer pilots, staff, and leaders, using the forwarding link at the end. Following prior disasters and major emergencies such as 911, Katrina, Haiti, and the 2017-2018 disastrous storms many groups organized volunteer pilots to provide relief flights, supplementing the work of the military, FEMA, state and local agencies, and tens of thousands of ground based first responders. You or other volunteers with your Public Benefit Flying organization may already be getting prepared to help those affected by the damage and flooding caused by these new events (and others that may follow). Or as the storms or other event begin to reach its ends you may be thinking of doing so. That is a great idea! You should consider what you and the other volunteers with your group can do to help. The sooner you get organized and make the appropriate contacts the more effective your response will be. Individual pilots and aircraft owners should work with established groups. The groups have the procedures and staffs to make contact with agencies involved in relief work and to provide appropriate assignments to new volunteers. Be aware that airports and other landing areas may become submerged or damaged. Find out if your proposed destination will be safe. Be absolutely sure to determine and comply with all Temporary Flight Restrictions and if you need to fly into one be sure to get the appropriate authorizations first. Double check all your planning and do not rush into affected areas or situations. You do NOT want to become part of the disaster! We will provide below a checklist of important safety protocols. Because of the calls for boats and for vehicles that can operate in flood waters as well as to offshore lake or ocean locations there may even be opportunities for seaplane pilots to help, although because of storm related winds and clouds, turbid waters, large amounts of debris, and hidden submerged objects such as signposts one must make sure that bodies of water are safe for landing, with the determination made by those familiar with seaplane operations. Be sure to have communications with those at the landing areas who can provide expert opinions. Know before you go! In addition few groups have seaplane pilots and owners enrolled in their programs, so each group will need to determine if and how to enroll and provide orientation rides to new members at the same time as their regular pilots are keeping the staff busy with land based relief operations. They may ask new members to help with nonflying work, or right seat help, until they can perform their normal enrollment processes. This kind of help is just as critical as flying! Volunteers practice loading injured people on to a waiting seaplane during an emergency exercise at Kala Point, Washington, 8-9-2017. Please consider how you and your group may be most effective in helping all those in need in a storm's or other disaster's path and surrounding areas, by flying in relief personnel and supplies, and transporting out those needing relocation - including animals. Note that pilots and others at airports in the impacted areas may be able to provide tremendous service by offering to help affected airports recover from any damage and by organizing efforts to load and unload supplies and provide ground transportation where appropriate. Contact the management of your local airport and determine if you can be of service. However - as always - follow the instructions of airport management and all first responders and their agencies. This is not only the law but wise, because you do not want to be seen as interrupting vital work or creating a hazard unknown to yourself. Be wise and be safe. Learn how more than twenty volunteer pilot groups helped out following 2017's hurricanes! All the pilots and groups who responded that year were collectively awarded the 2017 ACA-NAA National Public Benefit Flying Award for Teamwork. Read about their award and the contributions of the volunteers at this link. FLY SAFELY WHEN FLYING TO HELP OTHERS! 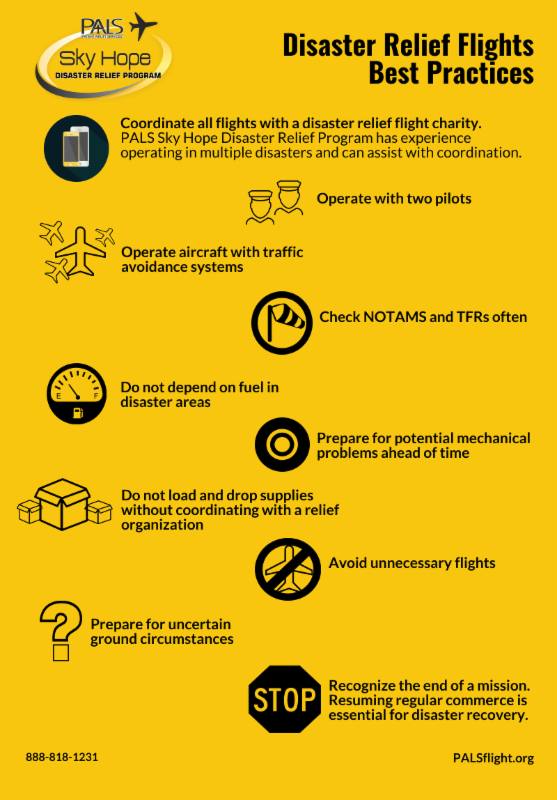 Air Care Alliance Member Group Patient Airlift Services (PALS) and their partner Sky Hope Network have developed some basic guidelines for volunteer pilots wishing to fly in support of relief efforts following the recent and current hurricanes - and any other disasters or major emergencies. and if you are not an AOPA member simply register for web access when asked. The course qualifies for your obtaining FAA Wings credit. Coordinate all flights with a disaster relief flight charity - Airspace and Airports are often congested after a disaster. In addition, information changes by the hour. Coordinating with a disaster relief flight charity can insure that resources are being maximized in an effort to save lives and help people. Sky Hope and other groups work with NBAA, AOPA, ACA and many other groups and government agencies to make sure they are providing the most up-to-date information to their pilots. Additionally, they often combine needs on the same flight, maximizing the capability of our aircraft. Operate with two pilots - The details surrounding a disaster relief flight can be challenging. Operate with two pilots to manage the workload. Stay on top of NOTAMS and TFRsby checking them regularly, and again prior to departure, for every flight. They can be enforced at any time. Experience is very important during disaster. The abnormal conditions during relief efforts call for experienced pilots who are instrument rated and current. Operate aircraft with traffic avoidance systems - Radar and flight following may or may not be available in the disaster area. In addition, flight operations will likely be in very high volume including private and government aircraft. Additionally, helicopters are often operating in disaster areas causing additional air traffic. Do not depend on fuel in disaster areas - Often fuel supplies have not been replenished or are in short supply. If fuel is available, there may be long waits to receive it or cash may be required to pay. Prepare for potential mechanical problems ahead of time - Resources to help fix flat tires or fix aircraft discrepancies will likely not be available. Consider adding a few spare tires and other items that may needed for any common mechanical issues. You do not want to get stuck in the disaster area due to an aircraft mechanical. Do not load and drop supplies without checking in with a relief flight charity - Dropping supplies on the ramp of a disaster area airport complicates the relief effort and can hinder ground operations. Please coordinate with the relief flight charities for any supply or volunteer needs. If you are flying supplies for a charity flight organization, use proper weighing equipment and prepare manifests. Avoid unnecessary flights - If you are flying for curiosity sake, don't. There are many needs trying to be met after a disaster and adding another aircraft operation can use valuable time and resources needed for other flights. Prepare for uncertain ground circumstances - Disaster areas are constantly changing. You may arrive at an airport under military control. You may have to deal with security issues on the ground. There may be evacuees at the airport asking for transportation. Be prepared. Recognizing the end of a mission- One of the most important things a community can do after a disaster is to resume normal economic operations. An abundance of donated supplies or donated flights can cause disruptions to normal local commerce. During the first gathering of the Air Care Alliance in 1990 and in subsequent AIR CARE meetings EVAC, the Emergency Volunteer Air Corps, has provided seminars and workshops on general aviation participation in emergency and disaster relief efforts. Otherwise keep in touch with the groups in your area to find out what they and their pilots may be doing in responding to the need for help following Hurricane Florence (and others). To find groups, you can use our Air Care Alliance automated "Request a Flight or Info" system. Click on http://www.aircarealliance.org/submit-request-for-assistance and follow the instructions. We at ACA and EVAC thoroughly appreciate all the work you and the other volunteers and supporters of public benefit flying groups are doing in order to help those in need and to serve out communities. If you are a group representative please be sure to share this information with your members and supporters. And if you like what the Air Care Alliance is doing, please visit our website to learn more, and consider a donation to support our work. This information has been compiled based on prior general aviation volunteer relief efforts following events including the 1989 Loma Prieta, 1994 Northridge, and Haiti earthquakes, 9/11 attacks, Hurricanes Hugo, Andrew, Katrina, Rita, and Gustav, and the international Tsunami response. EVAC compiled this information in association with the Air Care Alliance. The following information provides guidance on how to help. Please read it thoroughly and watch for updates, below, on our main page, and on those of other groups such as AOPA's, EAA's, and those of the aviation media. Volunteer Pilots - please be sure to take the AOPA Air Safety Institute Public Benefit Flying online course described below. Started on September 12, 2001,updated January, 2010 during the Haiti Earthquake, and additional updates to the date at the bottom. We and the Air Care Alliance received many inquiries from individuals and groups about how they could help following various emergencies and disasters, including following 9/11 and subsequent events described below. We were not initially aware of a large call then for general aviation services for disaster relief, although some groups were being called upon to transport blood or fly other missions, using the LifeGuard authorizations. Demand picked up quickly and ultimately several hundred missions were flown by volunteer pilots over a two week period. During and following hurricanes and other disasters there will likely be a more widespread call for help transporting emergency workers, supplies, or evacuees. First, regarding general aviation participation, please work directly with your own flying organizations to contribute in any pre-arranged efforts coordinated by their local emergency planning agencies. Many volunteer pilot public benefit flying groups will have an emergency services coordinator who can provide information. The Civil Air Patrol will be very involved in providing its resources in response to this situation, too. AOPA has collected much useful information for pilots flying relief missions or needing to fly into the affected areas. We expect AOPA to publish updated information regularly, so keep an eye on www.aopa.org and subscribe to AOPA's eNews alerts such as ePilot. EAA also publishes good coverage of relief efforts involving GA; please subscribe to their eNews alerts and keep an eye on their website. During the first days of 9/11 the Red Cross coordinated a blood drive, with certain types especially needed. If you are interested, call your local Red Cross chapter or 1 800 GIVE LIFE or 1 888 BLOOD-88 or do a search for a Red Cross web site serving your area. EVAC has concentrated its efforts on encouraging other public benefit flying organizations to use what it has learned and to form their own emergency service programs. Visit the other pages on this site to see various EVAC activities and regional contacts. If you wish to help EVAC promote general aviation relief work please contact us at mail@evac.org. INDIVIDUAL PILOTS can be extremely helpful in the early stages by going to their own local airports and volunteering to help with cleanup or repair activities, and with establishing a base for coordinating local agencies with incoming relief flights. This can include organizing volunteers to help with loading and unloading and local transportation. Pilots can also provide reports on airfield conditions and ask the airport operators to issue NOTAMS as appropriate. As we determine contact information for other groups who may need individual pilots we will provide it above. We anticipate that the need will be for fixed wing and helicopter aircraft. Seaplanes may prove useful in limited situations because many of the waters will have debris and hidden obstructions. Watch for better information as we obtain it. Many of these groups have emergency service or medical transport programs which may be operating. During the 9/11 emergency when airspace was closed the blood missions were being flown utilizing the "LifeGuard" call sign flight procedures designated by FAA. As airspace reopened routine transport missions were flown utilizing the ACA "Compassion" call sign procedures published on this site. Some Angel Flight groups also used the "Angel Flight" call sign, with procedures derived from the ACA's Compassion procedures. Please note, however, that during an emergency FEMA and other relief groups tend to be overloaded with offers of help. Most who are actually asked to fly missions do so through the various flying organizations in the ACA, or for local agencies and social service organizations. Thus we urge you to volunteer and fly with them. Please investigate a number of organizations flying in your area and offer your help to them. Note that during an emergency the groups may be to busy to conduct flight orientation rides in order to induct new pilots. In that case please volunteer for nonflying activities such as "right seat" help for their pilots, as well as ground operations such as loading and unloading supplies, etc. You will be just as essential for helping those in need by doing so as in flying. For those organizations such as volunteer pilot organizations, clubs, and airport associations wishing to help, EVAC - the Emergency Volunteer Air Corps - has provided much useful information including a sample short emergency operations guide, on this site. See the Short Guide. Please do send us emails describing any emergency relief operations in which you may participate or have knowledge so we can share your information with others. Thank you for your interest in using your time and skills to help others! We are compiling additional information and lists of contacts for groups and volunteers to offer their flying or other services. Please check back periodically to see that information posted here. Be aware that airports and other landing areas may be, or have been, submerged or damaged. Find out if your proposed destination will be safe. Observe all Temporary Flight Restrictions and if you need to fly into one be sure to get the appropriate authorizations. Double check all your planning and do not rush into affected areas or situations. You do NOT want to become part of the disaster! Note that some emergency authorities have called for folks with boats to help in areas affected by water. Seaplane pilots who may wish to help should be very careful if they are conducting operations for a volunteer pilot group or for emergency response authorities. Flooded areas will likeley have both floating and submerged debris, and other hazardous underwater obstacles. The waters are likely to be muddy as well. When flying into seaplane bases or lakes and other bodies of water it is best to first verify that qualified seaplane operators have verified the safety of landing areas. • Potential volunteers are asked to register with a voluntary or charitable organization of their choice, many of which are already in Texas and supporting survivors on the ground. The National and Texas VOAD websites are offering links to those who wish to register to volunteer with community- and faith-based organizations working in the field. • To ensure volunteer safety, as well as the safety of disaster survivors, volunteers should only go into affected areas with a specific volunteer assignment, proper safety gear and valid identification. • Volunteer generosity helps impacted communities heal from the tragic consequences of disasters, but recovery won’t happen overnight. There will be volunteer needs for many months, and years, after the disaster, so sign up now. This information underlines the fact that volunteer pilots should work through their organizations or see if they can find an organization that needs their help. The 2010 Haiti quake measured 7.0 on the Richter scale and devastated the country and its people, largely because of poor construction materials and techniques and lack of infrastructure to respond. In addition to the support and airlifts provided by military and international aid groups, hundreds of general aviation pilots, working through their public benefit flying (PBF) organizations, volunteered their planes and services to help out. As with the prior events below, EVAC circulated information about the quake and response to all the Air Care Alliance listed PBF groups as well as to the aviation and general media, and encouraged the groups to work together and follow safe procedures in responding. EVAC also fielded numerous offers of assistance from individual pilots and from companies, and funneled them to groups in their areas of the country which were providing aid. While the media focused on the large relief planes arriving at the Capitol, hundreds of flights were provided by GA pilots flying into smaller airports in Haiti, including to roads in areas without airfields, ferrying medical personnel, relief workers, and supplies; and then returning them or medical patients back to the United States. Many of the flights first flew from the U.S. to staging areas in the Dominican Republic, and then flew over the mountains into Haiti. EVAC again provided useful information and updates on the Air Care Alliance website, http://www.aircarealliance.org. Following the 2005 hurricane disasters EVAC provided information on the Air Care Alliance site for those who wished to help. Hundreds of pilots, working for a number of different groups, pitched in and provided vital transportation services during the aftermath. Information has been provided on the Air Care Alliance website http://www.aircarealliance.org/. In addition the volunteers were honored with a National Public Benefit Flying Award at the United States Capitol Building. Again, following the 2004 Tsunami disaster EVAC provided information on the Air Care Alliance site for those who wished to help, similar to the information posted above. With the distances involved most U.S. based pilots pitched in to help collect money and relief supplies. Some joined international relief organizations in order to help. The information on this site may be of use in thinking about how you might help during an emergency. Immediately following the attacks EVAC sent bulletins to all its contacts including all the groups listed in the Air Care Alliance database. The first flight took off that very day, an Angel Flight of Oklahoma volunteer pilot carrying blood test kits to St. Louis, where another volunteer flew them on to be delivered in New York city. We won't provide more details here. Suffice it to say numerous groups responded, and many flights were flown over the subsequent weeks. There have been a number of stories published about some of these relief flights flown in the aftermath of 9/11. We worked with the media in preparing some and helped collect information about them. Links to several have been provided by EVAC and can be found at the the Air Care Alliance website. When EVAC was formed in 1987 we presented sessions on the value that General Aviation volunteer pilots could provide following disasters at two meetings of the California Pilots Association, in San Diego County, California and in Concord, California. Two years later immediately following the 1989 Loma Prieta earthquake several attendees at the Concord meeting organized an ad hoc volunteer pilot airlift between Bay Area airports and Watsonville Airport to provide aid to stricken communities in the Santa Cruz area. EVAC also helped in encouraging or organizing GA support for Hurricanes Hugo and Andrew, floods in Guaymas, Mexico, and firefighting operations in Mammoth Lakes, Califonia. And of course beginning at the first conference of the Air Care Alliance in 1990 EVAC has provided seminars, workshops, and panels on general aviation relief at subsequent annual conferences, encouraging and urging the member groups of the Air Care Alliance and their leaders to be prepared to respond when emergencies occur. The rest is history. Final reminder - while it is wonderful that folks wish to help following an emergency it is far, far more helpful if volunteers get plugged into relief work BEFORE emergencies occur. If this is not an emergency situation please take some time and learn how you can work to improve our ability to really be of help when it is most needed! Please EMAIL US if you have additional information or comments about relief flights or news articles relating to the 9/11or other emergency situations.